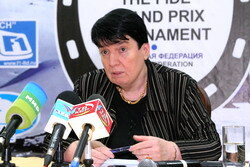 In Nalchik, at the “Sindika” hotel, within the framework of the Fourth FIDE Grand Prix tournament there was held a press-conference given by Nona Gaprindashvili, a world-renowned legendary Georgean chessplayer, a five-time world champion, the first woman in chess history to be awarded the Men’s International Grandmaster title. The press conference was participated by the federal, regional and local mass media. The world-famous chessplayer who had been President of the National Olympic Committee of Georgia informed all those present on her former presidential activity. At the Musical theatre of Nalchik there was held a ceremonial opening of the Fourth FIDE Grand Prix chess tournament. The ceremony was participated by KBR President Arsen Kanokov and FIDE President, the Head of the Republic of Kalmykia Kirsan Ilyumzhinov. In his greeting message Kirsan Ilyumzhinov emphasized that the tournament has a rating of 2725 points, being the highest among all the tournaments in this series. The salutatory messages to participants and guests of the fourth stage FIDE Grand Prix in Nalchik were directed by the President of Kabardino-Balkarian Republic Arsen Kanokov President FIDE, the Head of Kalmykia Kirsan Ilyumzhinov and the President of the Russian chess federation, the vice-premier of the Government of the Russian Federation Alexander Zhukov. 14 top-grandmasters will take part in the fourth FIDE Grand Prix series tournament in the Republic of Kabardino Balkaria in Russia. The fourth FIDE Grand Prix will be the strongest one in the series, and one of the strongest tournaments of the world this year. New functions on the FIDE website allow us to see the current rating changes of top-grandmasters. 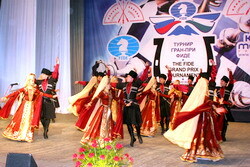 The average rating of the tournament in Nalchik will be around 2725 points based on the April 2009 list to be published soon. Previously the highest average rated tournament was held in the third stage of the series, Elista (2715 points). The tournament is so evenly balanced that everyone of the 14 participants who comes to Nalchik is in a good position to win the tournament. The top-rated player of the competition is the World Cup 2005 and Olympiad winner Levon Aronian (Armenia). Two players have also shown excellent results this year: Alexander Grischuk (Russia) - the winner of Linares and Elista super tournaments, and Sergey Karjakin (Ukraine), who has won the Corus tournament in January in Wijk-an-Zee. World Cup 2007 winner Gata Kamsky (USA) this year has shown also a good performance during the Challenge match against Veselin Topalov. The FIDE Grand Prix is a series of six tournaments held over two years (2008-2009) in leading world cities. It has given a number of young players such as Wang Yue and Vugar Gashimov, the opportunity to come to the forefront of the chess world. 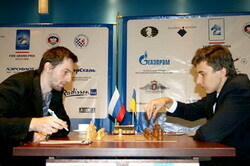 The winner of the Grand Prix series will play in 2011 in the Candidate event of the World Championship Cycle.